Argan Tree, belonging to the family Sapotaceae, is endemic to the southwestern Morocco where they occupy around 8,000 km2 and can live for more than 200 years. In 1998, UNESCO declared this Argan forest as a Biosphere Reserve due to its ecological value and its importance for the local economy of the area. Argan oil is extracted from the kernels of the Argan tree. The fruit is green and fleshy on the outside, and contains a hard-shelled stone, with two or three kernels where the oil is obtained from. 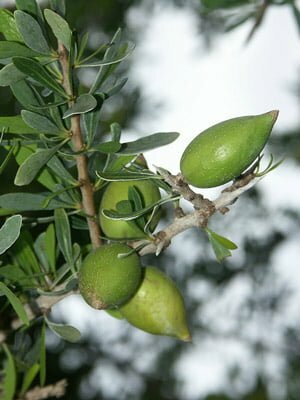 How is Argan Oil extracted? Also known as ‘Moroccan Liquid Gold’, Argan Oil is extracted from kernels that are collected exclusively by women through ancestral methods of Berber tradition. 1 liter of Argan Oil within 4 hours of processing can be preserved for up to 2 years, containing a high amount of antioxidants, premium quality, low humidity, bitter taste, and golden colour. Argan Oil is the secret of Moroccan women and has been traditionally used for hundreds of years to reduce wrinkles and moisturise dry skin due to anti-ageing properties. Moroccan women also used it to remove blackheads from the skin, improve scars appearance, brittle nails and to enhance shine and strength of hair. 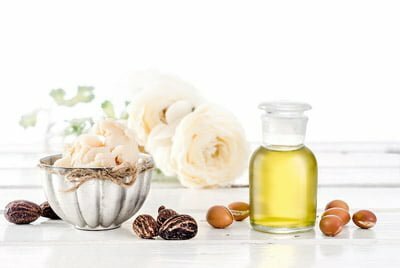 In order of importance, Argan Oil contains polyunsaturated fatty acids (oleic 49%, linoleic 36%), squalene, tocopherols (especially gamma-tocopherol), phenolic compounds (ferulic acid, among others) and sterols. This combination of compounds makes it extremely useful for anti-ageing, elasticity, and moistening of the skin and hair. Anti-photoageing effect: due to its antioxidant capacity (thanks to the presence of gamma-tocopherol, squalene and ferulic acid) Argan Oil decreases oxidative damage, thus reducing the formation of wrinkles and slowing the signs of ageing. Emollient Effect: Argan Oil is quickly and efficiently absorbed into the deeper layers of the skin due to the activity of fatty acids (such as oleic and linoleic) and squalene, restoring smoothness and flexibility of the skin and hair. Anti-inflammatory effect: contributes to the revitalisation of the skin and hair, providing firmness and strength especially due to the action of sterols and phenols. Moisturising effect: the synergy of fatty acids and squalene contributes to the maintenance of the skin’s protective barrier, reducing water loss and favouring hydration and elasticity. Argan oil is used for hair and skin care, including face, body, and nails. Different studies have determined that argan oil reduces the loss of hair protein by 42%, which helps strengthen the hair5. Argan oil also significantly restores the skin elasticity. Argan oil can be applied to the skin of the face, neck or body. Always on clean skin (wet or dry), massaging gently until the oil is completely absorbed. Alone or complementing our usual moisturising cream: Argan oil can be applied alone or can be added to our daily moisturising lotion. In the second scenario, apply a small amount of Argan oil on the palm of the hand and add the necessary amount of your daily moisturising lotion. Mix and spread with a gentle massage on the skin. For a perfect and glowing makeup: the Moroccan golden oil is a perfect pre-makeup that is increasingly popular amongst famous stylists all over the world. This technique is known as ‘gold-flecked oil face’ and consists in applying the makeup base on the face and then put a few drops of Bio Argan Oil on a damp beauty sponge before applying the makeup foundation. Argan oil can be applied directly on the hair, but it can also be combined with our usual shampoo or conditioner to enjoy the properties of Argan oil in hair. Directly on clean and wet hair: after washing the hair and before drying and combing, we apply a small amount of Argan oil from the middle to the ends, to get a shine and soft hair. Before shampooing on wet hair: if your hair is dry or damaged, apply the Argan oil from the root to the ends and let it work up to 20-30 minutes before rinsing and washing. If your hair is oily, apply Argan oil from the middle to the ends and let it work for less than 20 minutes. Argan oil can be also used to repair split ends by applying a few drops on the damaged ends and even leaving the oil to act overnight before rinsing and washing. Combined with shampoo or conditioner: to combine Argan oil with your shampoo or conditioner, simply apply a few drops of the oil on the palm of your hand and add the necessary amount of shampoo or conditioner. Mix, massage the hair and rinse. References: 1) Guillaume, D. et al. 2011 . 2) Ansuategui, M. et al, 2015. 3) Boucetta, K. Q. et al, 2015. 4) Mello Faria, P. et al, 2013.